Following the Freys: What is the big pit for? 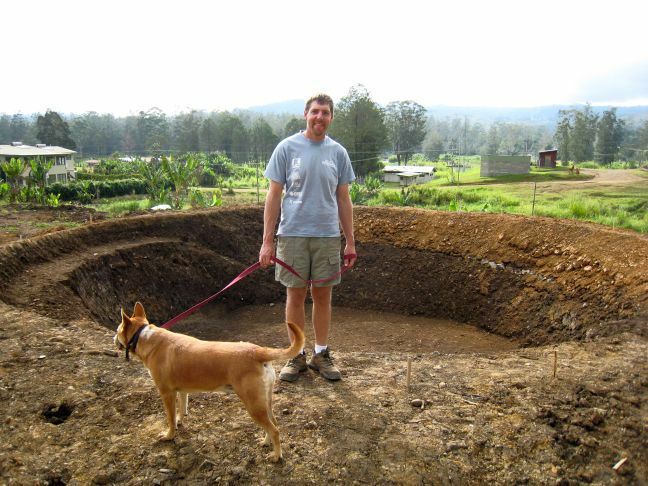 This big pit was recently dug on our center. What do you think it’s going to be? A community swimming pool? A koi pond? 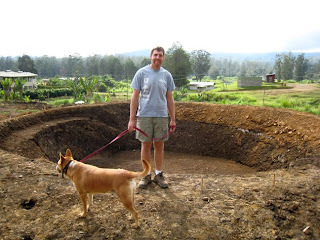 Actually, it’s going to be a new slow sand filter to help clean our water supply. Brian’s department has been working on this project. All of the houses here have tanks that catch rain water off of the metal roofs, and that’s what we use for drinking. However, water is pumped from the nearby river for a lot of other uses like toilets, showers, laundry or irrigation. The river water can be pretty muddy at times, especially when there has been a lot of rain that stirs up debris in the river. Below is a diagram of how it will work. The hole will be filled with a layer of gravel, then sand. A layer of green that consists of bacteria, fungi and protozoa will grow on top of the sand, and is called the Schmutzdecke. That is really what does a lot of the filtering. After filtering through all three layers, the water is supposed to come out clean at the bottom. Apparently this approach to water filtering is very common in Great Britain.